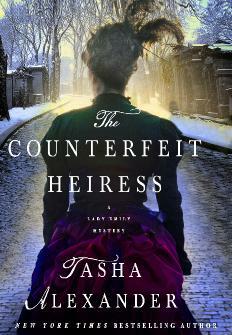 This recently published book in the Lady Emily series, The Counterfeit Heiress, is an engaging, fast-paced, and delightful ‘whodunit’. I have always enjoyed the structure of Tasha’s novels. The chapters are short, yet end with a difficult to resist enticement that makes it nearly impossible to set the book down without at least an almost childish peak into the next chapter. Also, as she has done in her past books, there are two parallel story lines that add to the mystery by raising the necessary question – how and when will the two accounts ever converge? Be sure to carefully read the first two chapters. I found it necessary to read through them several times, knowing that the author has proven to be purposeful in every word that she has selected. What may initially appear to be unnecessary detail, has actually been carefully and cleverly crafted to set the stage for all that follows. Throughout this volume there are many gems – not only in historically accurate facts, but you will also encounter many memorable expressions. The author has thoroughly done her homework and has produced a masterpiece that weaves together suspense, romance, humor, and intriguing insight into the Victorian age. Though this is a continuing series, you will not have to read the eight volumes that preceded this new one in order to understand and appreciate the current book. It nicely stands alone. Each old character is adequately reintroduced, while the character of each new individual is carefully developed without being tediously over described. In the end, Lady Emily, along with her husband Colin and a couple of dear friends, solve the mystery of the counterfeit heiress. Enjoy. This entry was posted on October 6, 2014 at 6:34 pm and is filed under Book Review with tags Counterfeit Heiress, Lady Emily, Tasha Alexander, Victorian. You can follow any responses to this entry through the RSS 2.0 feed. You can leave a response, or trackback from your own site.